Since Chemical Science was launched in 2010, we have been overwhelmed by the support of our global community. And with our latest Impact factor at 9.144, according to citation data released by Thomson Reuters in its 2015 Journal Citation Reports®, we are truly grateful to all of you – our authors, referees, readers, Associate Editors, and Editorial and Advisory Board members – for your enthusiastic support towards the journal’s success. In less than six years, Chemical Science has grown and developed into one of the world’s leading chemistry journals, maintaining a strong and sustained impact, even as we saw significant growth in the number of articles published in recent years. And having gone open access in 2015, it continues to be free to read, as well as free for authors to publish in – all publication charges continue to be waived. Therefore through Chemical Science your high-quality work can be freely read, with absolutely no barriers, by your peers and by researchers around the world. With increasing submissions, this does mean that now – more than ever – it is essential that we publish only the best of the best, nothing less than the most exceptional science. For us, it’s all about quality and excellence, recognition and visibility, as we aim higher for the rest of 2016 and beyond. We aim for Chemical Science to be the global home for cutting-edge solutions to today’s most pressing challenges, communicated worldwide, without barriers – will you join us as we move closer to our vision? Then submit only your top-quality work to Chemical Science, and be a key part of the solution. *The Impact Factor provides an indication of the average number of citations per paper. Produced annually, Impact Factors are calculated by dividing the number of citations in a year to articles published in the preceding two years, by the number of citeable articles published in the preceding two years. Data based on 2015 Journal Citation Reports®, (Thomson Reuters, 2016). We are delighted to announce that Chemical Science’s latest Impact Factor has soared to an impressive 9.211 this year, according to the 2014 Journal Citation Reports®. Thank you to all our authors, referees, Associate Editors, and Editorial and Advisory Board members for contributing to the journal’s continued impact and success – this achievement would not have been possible without your support and trust. Chemical Science remains dedicated to publishing research of exceptional significance from across the chemical sciences – for us, it’s all about giving our authors the visibility and recognition their research deserves. Chemical Science became a gold open access journal in January 2015, giving the global community free access to high quality research while waiving all Article Processing Charges (APCs), keeping articles free to publish, for at least two years. This unique combination of open access, top quality articles, a flexible format and world-class Associate Editors makes it clear why so many leading scientists choose to publish in Chemical Science. We invite you to submit your exceptional research to Chemical Science today. Take a look at our most highly cited articles listed below. Read more Impact Factor highlights for the Royal Society of Chemistry’s leading journals, including Chemical Communications and Chemical Society Reviews. Chemical Science is the world’s first high-quality gold open access chemistry journal (open access from January 2015). Set up a personal account on the publishing platform to download articles for free. Chemical Science is dedicated to publishing research of exceptional significance from across the chemical sciences. For us, it’s all about giving our authors the visibility and recognition their research deserves. We are delighted to announce that our 2013 Impact Factor* has risen to an impressive 8.601. This fantastic result further demonstrates that Chemical Science is one of the leading general chemistry journals. Our unique combination of high quality articles, flexible format and excellent Associate Editors, makes it clear why so many leading scientists have already chosen to publish in Chemical Science. You can see our most highly cited articles listed below. By moving Chemical Science to Gold Open Access, we are giving the global community access to some of the very best research. Read our Press Release to find out more. Author(s): He, Qiyuan; Wu, Shixin; Yin, Zongyou; et al. We are delighted to announce that Chemical Science has now been listed in Thomson Reuters’ Science Citation Index® (SCI). The journal has featured in the Science Citation Index Expanded™ (SCIE), the database behind Web of Science™, since its launch; however we are pleased to now feature in the SCI as well. The SCI contains the highest ranking journals in their fields, further emphasizing the quality of research published in Chemical Science. Read more about the citation profile and Impact Factor of Chemical Science. We want our authors’ research to get the recognition it deserves: Publishing in Chemical Science means your article will have excellent visibility and impact. 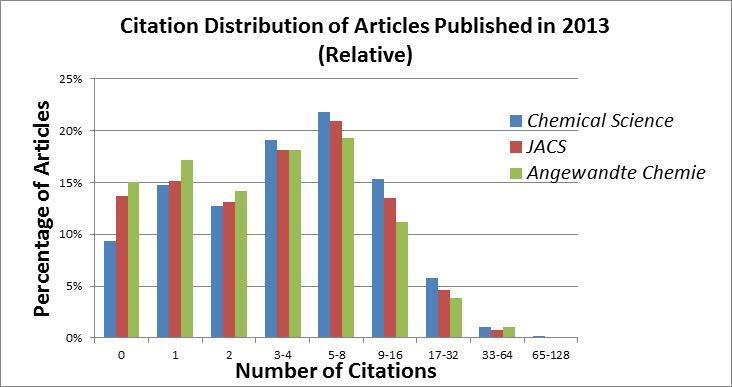 Graph 1 below shows the number of citations to articles published so far in 2013 in Chemical Science and other similar general chemistry journals – showing that articles in Chemical Science are read and cited quickly. *Figures from the 2012 Journal Citation Report © 2013 Thomson Reuters. The Immediacy Index is the average number of times an article is cited in the year it is published and indicates how quickly articles in a journal are cited. So we are delighted to announce that our 2012 Impact Factor* has risen to an impressive 8.314. 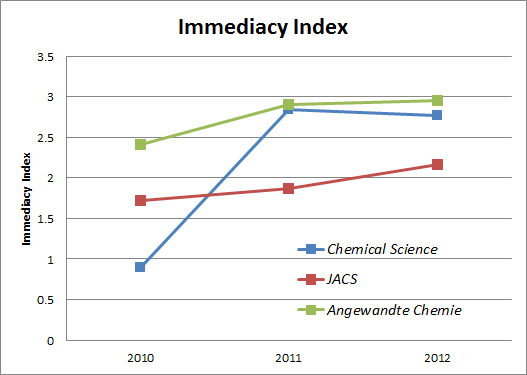 This fantastic result further demonstrates that Chemical Science is one of the leading general chemistry journals. Publishing your research in Chemical Science means your article will have excellent visibility and will be read and cited by your colleagues. See the citation profile of Chemical Science articles compared to other leading general chemistry journals. Author(s): Surry, David S.; Buchwald, Stephen L.
Author(s): Rinehart, Jeffrey D.; Long, Jeffrey R.
Author(s): Webb, Damien; Jamison, Timothy F.
Author(s): Breiner, Boris; Clegg, Jack K.; Nitschke, Jonathan R.
Author(s): Dreyer, Daniel R.; Bielawski, Christopher W.
Author(s): Sumida, Kenji; Horike, Satoshi; Kaye, Steven S.; et al. Author(s): Dawson, Robert; Adams, Dave J.; Cooper, Andrew I. Chemical Science is dedicated to publishing findings of exceptional significance from across the chemical sciences. We want our authors’ research to get the visibility and recognition it deserves. 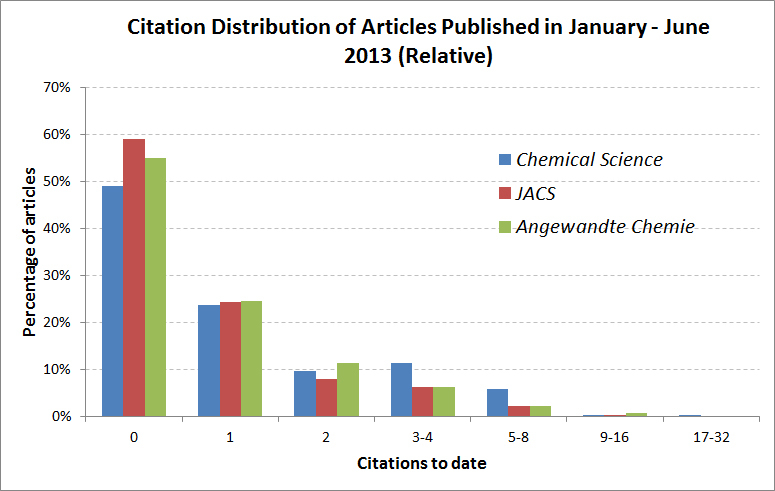 The graph below shows the number of citations to articles published in 2012 in Chemical Science and other leading general chemistry journals. 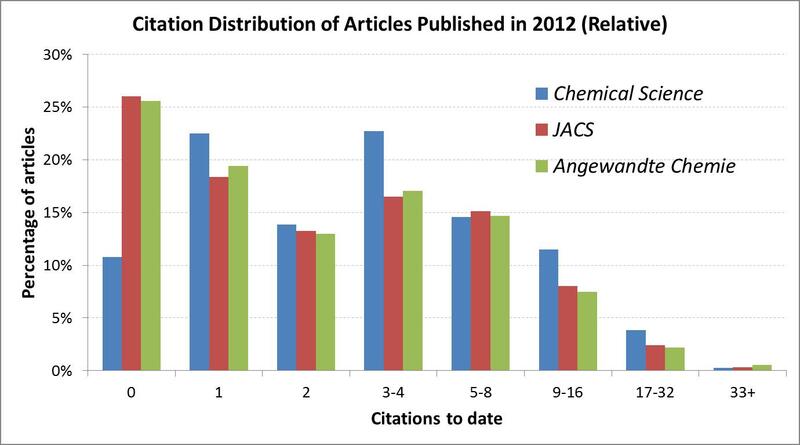 It’s clear to see from this data that articles in Chemical Science are less likely to receive no citations and after just a few months of publication articles will be highly cited – 30% of 2012 Chemical Science articles have already received 5 or more citations. At Chemical Science, our focus is quality. We are committed to publishing only the most exceptional research. That’s why we are delighted by our first Impact Factor* – an impressive 7.525. This is a tremendous result for a new journal and it firmly places Chemical Science in the top tier of general chemistry journals. Thank you to all who have made this possible – our authors, referees, readers and Editorial and Advisory Boards. Our unique combination of high quality articles, outstanding Associate Editors, free colour and flexible format makes it clear why so many leading scientists have already chosen to publish in Chemical Science. Join them – submit your exceptional research today to be seen with the best. *The Impact Factor provides an indication of the average number of citations per paper. Produced annually, Impact Factors are calculated by dividing the number of citations in a year, by the number of citeable articles published in the preceding two years. Data based on 2011 Journal Citation Reports®, (Thomson Reuters, 2012).